London's Victoria & Albert Museum will open a major new exhibition on Wednesday, comprising 10 galleries containing medieval and renaissance art spanning more than 1,000 years. The V&A’s new Medieval and Renaissance Galleries is now home to one of the world’s most remarkable collections of treasures from the period, including the Becket Casket, Gothic altarpieces and the notebooks of Leonardo da Vinci. There will also be an outstanding collection of Renaissance sculpture by Italian masters such as Donatello and Giambologna. Ten galleries, occupying an entire wing of the Museum, will for the first time present the collections in continuous displays to tell the story of European art and design from the fall of the Roman Empire to the end of the Renaissance period. In a review for the Daily Telegraph, Richard Dorment describes the exhibition: "The 10 contiguous galleries occupying two floors of that vast building on the Cromwell Road feel like a museum within a museum, where every effort is made to give a feel for a church interior or Renaissance study without turning the galleries into a succession of stage sets." The V&A is redisplaying more than 1800 objects from the period AD 300 to 1600. The £30 million Medieval and Renaissance Galleries are the biggest project the V&A has undertaken since the British Galleries opened in 2001. They have been generously funded by a £9.75m grant from the Heritage Lottery Fund (HLF) as well as private donations. Their opening marks the end of the First Phase of the V&A’s Future Plan. Architects MUMA have designed the new galleries, reconfiguring existing museum spaces and constructing a new day-lit gallery from a previously unused area, using nine metre long glass beams to connect the façades. The V&A is creating beautiful and innovative new displays which place objects within their original social and cultural context. 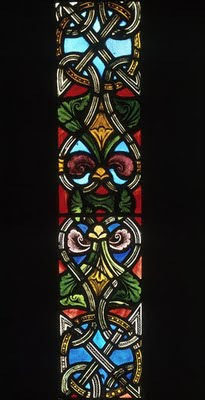 In a gallery of religious artworks, light will filter through translucent onyx window screens, suggesting the use of such windows in medieval churches. Dramatic sculptures by Giambologna and others will stand in a gallery exploring the Renaissance City, next to trees and water evoking a courtyard and garden. The new galleries will make connections between the medieval and Renaissance periods with objects from both northern and southern Europe. The displays will be chronological and each gallery will have its own narrative highlighting themes, stories, historical figures and important patrons, such as the Emperor Charlemagne and the Medici family. The V&A has one of the largest collections of Italian Renaissance sculpture outside Italy, including an exceptional group of sculptures by Donatello, the most gifted and innovative sculptor of his age. An entire gallery will be devoted to the work of this 15th-century sculptor, along with work by his contemporaries and followers. Displays will explore Renaissance ideas and beliefs, including the influence of antiquity. Luca della Robbia’s 12 glazed terracotta ceiling roundels from Piero de’ Medici’s study of 1450-56 will be displayed to evoke the setting and space of the original study of the powerful Florentine patron. The elegant Santa Chiara Chapel is the only example of Florentine Renaissance church architecture to be seen outside Italy. Another large-scale and imposing architectural feature will be the choir screen from the Cathedral of St John at ‘s-Hertogenbosch (1610–13) in the Netherlands, one of the largest objects on show. Masterpieces of medieval craftsmanship will include the largest and most splendid of the enamel caskets dedicated to St Thomas Becket (about 1180) and the elaborate Gloucester Candlestick (1104-15). The Symmachi Panel, one of the finest surviving ivories from the Late Antique period in Rome, dated around 400, will show the influence of the later Roman Empire on medieval art. Another rare and exceptional object, the Lorsch Gospels Cover, is one of the largest and grandest ivory medieval book covers to have survived from the Court of Charlemagne in around 800. An 11th-century statuette of the Virgin and Child is the only Byzantine ivory figure to be carved entirely in the round. Luxury goods such as the gold and enamelled Mérode Cup (1400-1420) from the lavish court of Burgundy will illustrate the theme of noble living, focussing on scenes of ostentatious display related to hunting, dining and courtship. Many highlights will come from the V&A’s internationally significant collections of textiles. The magnificent Boar and Bear Hunt is one of the so-called Devonshire Hunting Tapestries, the only great hunting tapestries to have survived from the 15th century. On display will be the Troy Tapestry which epitomises in its depiction of the Trojan wars luxury tapestry production in the Netherlands. A major programme of conservation work is being undertaken to prepare objects for display in the new galleries, providing curators and conservators with an opportunity to study objects in more detail and often bringing to light new information about their history and function. The Victoria & Albert Museum will open its Medieval & Renaissance Gallery on December 2nd. Click here to go to the V & A website. One half of Medievalists.net just got married today. Congratulations to Sandra and her husband Michael. Adam Shear, assistant professor of religious studies at the University of Pittsburgh, is the winner of the Morris D. Forkosch Prize for the best book in intellectual history published in 2008. The prize is awarded by the Journal of the History of Ideas. Shearer's book, The Kuzari and the Shaping of Jewish Identity, 1167-1900 (Cambridge University Press, 2008), follows the influence of the Kuzari and the way it has been read and understood over the years. As research for his book, Shear surveyed the activities of readers, commentators, copyists, and printers that have taken place over 700 years to trace the ways the “Kuzari” became a classic of Jewish thought. He found that views of the work before the 19th century differed greatly from those of the 20th century. In modern Jewish thought, the “Kuzari” has often been contrasted with Moses Maimonides' Guide of the Perplexed. The Forkosch Prize committee said Shear's “highly original book is able to combine scholarly depth and historical breadth without sacrificing accessibility to the non-specialist reader-a rare achievement.” The prize includes an award of $2,000. Shear joined the Pitt religious studies faculty in 2001. His areas of expertise include medieval and early modern Jewish cultural and intellectual history, the impact of print on Jewish culture and thought in the early-modern period, and the cultural role of Jewish philosophy in the formation of early-modern Jewish identities. Monte Verità in Switzerland will host the International Medieval Conference next year. The conference is taking place from October 17-22 on the theme 'St. Thomas Becket and the Vernacular Medieval Literature'. For Medievalists the Becket-Henry affair presents an ideal case study: the career of Thomas Becket, culminating in his murder (1170) is undoubtedly the best documented event in the twelfth century. The dramatic martyrdom of the Archbishop of Canterbury generated an unusual number of biographies, letters, histories. New avenues of research are now opening up for Philologists, since recent studies have begun to show that Becket's eruditi wrote not only in Latin, but also in vernacular (i. e. Anglo-Norman and French). A) 1155-1170: "Warriors of God and Culture. Thomas Becket and his eruditi"
B) After 1170. "Perpetuating Myth"
The conference is being organized by the Becket Project, which is led by Carla Rossi of the University of Zurich. The Becket Project focuses on the relations which vernacular authors forged with those eruditi, and on the cultural program pursued by vernacular authors and by the circle of Canterbury scholars, whose purpose was to establish traditional, epochal genealogical and religious foundations for courtly Anglo-Norman society. Several scholars have already committed to giving papers at the conference, including Michel Zink, Michael Staunton, Donna Bussell and Ian Short. Click here to learn more about the conference and the Becket Project. The Anglo-Saxon missionary and archbishop St Boniface (d.754) and Lul, his protégé and successor in the see of Mainz (d.768), left behind a rich collection of letters that has become an invaluable source in our understanding of Boniface's mission. This article examines the letters in order to elucidate the customs of gift-giving that existed between those who were involved in the mission, whether directly or as external supporters. It begins with a brief overview of anthropological models of gift-giving, followed by a discussion of the portrayal of gift-giving in Anglo-Saxon literature. Two features of the letters of Boniface and Lul are then examined — the giving of gifts and the giving of books — and a crucial distinction between them revealed. Although particular customs of gift-giving between the missionaries and their supporters were well established, and indeed bore some resemblance to ‘secular’ gift-giving customs depicted in Anglo-Saxon poetry, books, while exchanged frequently, were consistently excluded from the ritualised structures of gift-giving. A dual explanation for this phenomenon is proposed: first, that books were of greater practical importance to the mission than other forms of gifts; second, that their status as sacred texts rendered them unsuitable for inclusion within rituals that depended upon the giver emphatically belittling the material worth of their own gift. This essay examines the intersections of discipline, compassion and community in a selection of monastic texts from the late tenth through to the mid-thirteenth centuries, focusing on disciplinary rituals involving punitive flogging or flagellation. Although members of all of the major religious orders viewed flogging as a necessary method of correction needing little or no justification, as evidenced by customaries, letters, and even miracle collections, few scholars have examined the role of this practice in the shaping of monastic culture. This essay suggests that disciplinary rituals served a number of related functions within coenobitic monasticism: they reinforced hierarchies within communities, tested individuals' mastery of the virtues of humility and obedience, expressed superiors' compassion and love for their subordinates, and reminded penitents and spectators alike of Christ's bodily suffering. These conclusions are further supported by a close reading of Peter the Venerable's vita of the Cluniac prior Matthew of Albano, a text which depicts disciplinary violence as a synthetic element of monastic life, as well as a ritual means of promoting the spiritual growth of individuals and entire communities. The lifestyles of the three earliest Dominican women's communities were formulated according to their specific historical conditions and exigencies during the years 1206–21. Initially, the women associated with the preaching mission of Diego of Osma and Dominic Guzman were based at Prouille in the Languedoc and followed the Augustinian Rule. The development of the first instituta for Dominican nuns was the result of 15 years of overseeing the lives of the sisters. However, enclosure, and the institutional requirement for its observance, only came about in 1220 with the establishment of San Sisto, when St Dominic wrote an instituta specifically intended for a cloistered nunnery. This paper retraces and elucidates the historical development of the first Dominican instituta for women, and considers the remarkable choice of the Augustinian Rule as the basis for an enclosed women's order. This article examines the relationship between Cistercian nunneries and the crusade movement and considers the role of gender in light of the new emphasis on penitential piety and suffering prevalent during the thirteenth century. Focused on evidence from the region of Champagne in northern France, it argues that female family members of male crusaders adopted Cistercian spirituality as a means of participating in the experience of suffering and the pursuit of the imitation of Christ that had come to be associated with the act of crusading. The connection between Cistercian nuns and crusaders was further strengthened during this period as the Cistercian order expanded its liturgy to include specific rounds of prayers for success in the east and in southern France, for Jerusalem, and for the well-being of crusaders. Many crusader families in Champagne founded Cistercian nunneries to function as family necropolises, further sharpening the connections between crusaders, memory, and suffering as experienced in female Cistercian houses. This article analyses the changing visual representation of St Barbara during the later middle ages. The article identifies a shift in St Barbara's iconography: whereas earlier medieval representations of the saint almost always show her with her prison tower, a number of fifteenth-century representations show the saint holding a chalice and host. The article traces how and why this shift occurred. In particular, the article explores the ways in which medieval thinking linking incarceration and liberation were integrated into new representations of St Barbara to stress her intercessionary, sacramental functions. Overall, the article argues that the visual transformation of St Barbara's prison tower into a liturgical vessel reveals how saints like Barbara were increasingly viewed as conduits to the inclusive sort of freedom that participation in Christianity's sacramental economy invited. Although the general historical context of Christine de Pizan's Livre du corps de policie (LCP), the Orleanist-Burgundian feud occasioned by the periodic insanity of King Charles VI, has long been recognised, the precise argument that the author wages through her unique configuration of the third part of the body politic has not been explored. This essay reads the LCP as an intervention into the escalating struggle for power between Charles VI's brother, the duke of Orleans, and his cousin, the duke of Burgundy. Christine's purpose emerges most clearly in her peculiar arrangement of the third part of her body politic, le peuple, where two points bear particular consideration: her inclusion of the University and her division of the ‘merchants’ across two separate categories, a repartition which seems to refer to the contemporary distinction between the highly-placed merchants of Paris and the butchers. Christine seems to be arguing that if the University were to make common cause with the ruling burghers and well-placed merchants, they could force into submission their more restless brothers and sisters, the butchers and their thuggish followers, whom the duke of Burgundy would finally convince to rise up in 1413 in what has become known as the Cabochian Revolt. The Journal of Medieval History is published by Elsevier. Click here to go to their website. An Oxford University Emeritus Fellow has received a prestigious award from the American Musicological Society for an 'outstanding scholarly edition in the field of musicology' that she has been working on for almost 35 years. The 2009 Claude Palisca Award has been awarded to Bologna Q15: The Making and Remaking of a Musical Manuscript, an introductory study and facsimile edition by Dr Margaret Bent described as ‘a scholarly achievement of the highest order’. Dr Bent’s work was the ‘unanimous choice’ for this year’s award. The Palisca Award committee said it was described by one of its members as ‘an exemplar of "regal musicology", a career-crowning achievement that will forever set a benchmark for facsimile editions.’ It described the quality of photography and reproduction as ‘breathtaking’. Aside from Dr Bent's contributions, the publication has other links with the Oxford Music Faculty. DIAMM (the Digital Image Archive of Medieval Music), based in the Faculty, played a central role in providing the high-quality photography for the facsimile as its co-director Dr Julia Craig-McFeely undertook the photography, typesetting and layout. DIAMM is to be a key part of the Faculty's well-advanced plans to establish a Centre in Early Music. Dr Bent said: 'I have been working on this manuscript for many years, alongside other projects. 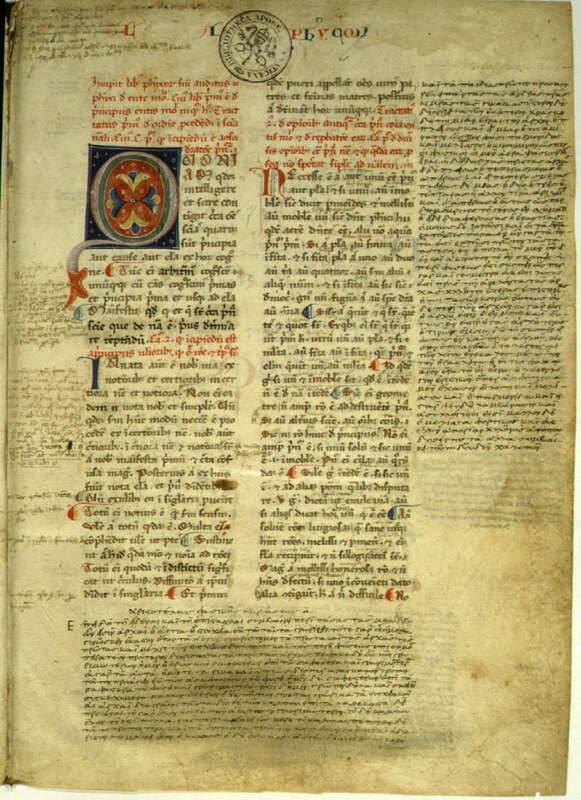 Compiled in the Veneto, it is the most important manuscript of international musical repertory of the early 15th century, and our only source for much music by major composers such as Du Fay. 'Codicologically it is extremely complex; its various revisions carry rare and valuable evidence about how a repertory underwent rapid renewal in the hands of its contemporaries – sorting it out is like a cross between a jigsaw puzzle and peeling the skins off an onion. My introductory study is a major new contribution to scholarship, and will enable future scholars to understand and use a central manuscript that has been puzzling and inaccessible. The committee said: ‘Photographed in colour when it was disbound, with illegible pages digitally restored, the edition allows us to read some music for the very first time. Initials have been filmed on both sides enabling the editor to discern music that was discarded when the manuscript was recopied. Reproducing the original cover, watermarks, and gathering signatures, the facsimile can actually claim to be more useful and informative than having the original on one's desk. In the Umda (Umdat al-tabib), a botanical work attributed to Abu I-Jayr and dated from between the 11th and 12th centuries, the ornamental use of this flower in the Iberian Peninsula's territories under Islamic domain is indicated. It is probable that a known 11th century agronomist from Toledo, Ibn Bassal (¨the onion-vendor's son¨) played a protagonist role in the introduction and the first cultivation of the tulip in Iberian territory. The study, brought to light by the magazine Economic Botany, a publication promoted by the New York Botanical Garden, overthrows the traditionally accepted version that the tulip arrived to Holland from the Ottoman Empire, passing through central Europe. According to the new theory, the ornamental origin of the flower is in Byzantium, and arrived to Europe by means of the Seljuq Turks, through what today is Andalusia. "We cannot be categorical with this, but we defend the proposed hypothesis and we give fairly solid arguments," explains Hernández Bermejo. The groups directed by Hernández Bermejo and García Sánchez have spent more than 20 years "studying the texts and contributions of Andalusian agronomists and botanists to agriculture, the world of ornamental plants and medicinal plants, and the knowledge of our wild flora." 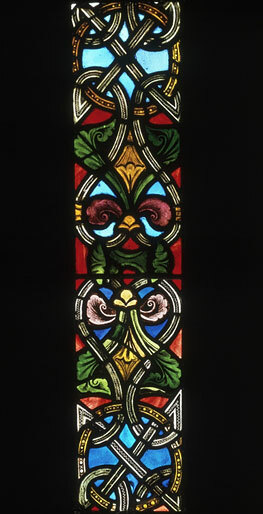 "The existence of representations of tulips in the Temples of Konya (Turkey) which date from the 11th century, and the mention of al-Andalus in the Umda, point towards the introduction of tulips into the European ornamental world some 500 years before the references known up until today," indicates Hernández Bermejo. Previously, their expansion into Holland was situated at the end of the 16th century. The tulip is the national flower in Iran and Turkey, in addition to the Netherlands, where its cultivation has been traditionally important for more than four centuries. But already by the 13th century, Turkish poet Mevlana Celaleddin Rumi defined the tulip as, "the most sad smile of them all." Up until today, numerous theories have refuted the tulip's arrival to Europe from the Ottoman Empire by way of the Hapsburg Empire until reaching Holland. One of the more popular indicates that Ogier Ghislain of Busbecq, the ambassador of Ferdinand of Hapsburg I in Suleymán's court, was the first to alert the Western world as to the beauty of these bulbs, "which the Turks know as tulips", in 1554. However, and in spite of the fact that Abu I-Jayr's agricultural document analyzed by Hernández Bermejo and García Sánchez precedes Busbecq's testimonies by various centuries, the tulip's Andalusian route has not been proven at this time. For the researchers, one of the reasons for this is that, "despite the feverish fad known as ´tulip mania´ which began in Holland in the 17th century; no testimony was gathered in our country." The authors of the study examined the book Agricultura de Jardines (Agriculture of Gardens) without finding a trace of tulips, a manual written in 1604 by Gregorio de los Ríos, an expert gardener who Philip II later made Chaplain of the Casa de Campo. The monarch himself, affirm Hernández and García in their study, ¨was a connoisseur of botany and"wrote about ornamental bulbs in the letters to his daughters, mentioning narcissuses, but not tulips." The Umda, by Abu I-Jayr, is the most important contribution to the knowledge of wild flora in al-Andalus and the western Mediterranean, but it is not the only testimony gathered by the study to reinforce this new model of the history of tulips. One century later, Ibn al-‘Awwam wrote his Kitab al-Filaba, one of the few Andalusian agricultural documents still conserved in its totality. The value of this encyclopedia on rural economy includes a multitude of citations from Andalusian and Oriental texts, which justifies its great historical and testimonial value. About tulips, Ibn al-‘Awwam (who denominated the flower as a 'Macedonian onion') says the following: "It is a type of yellow narcissus and comes from Macedonia, province of Alexandria. Its flower is yellow inside and pink outside, shaped like a cube. Another beautiful and aromatic flower is found in its interior. It grows in moist and mountainous places and is cultivated like the yellow narcissus." At the beginning, the description of this "Macedonian onion with a cube-shaped flower¨ was confusing and did not allow scientists to identify it as the tulip. It was upon collating this text with the Umda -especially the morphological descriptions of the flower, its leaves, its roots and its flowering period- when the team realized that they were before the first historical evidence of the presence of tulips in Europe. Now, the research team is about to complete, along with scientists such as Julia Carabaza from the University of Seville, a complete work on Andalusian Agricultural Flora. A committee of independent advisors have valued the Staffordshire Hoard at £3.285 million. This figure will be split equally between the finder, Terry Herbert, and the landowner, Fred Johnson. The landowner, the finder and the two museums which hope to acquire the hoard, Birmingham Museum & Art Gallery and the Potteries Museum & Art Gallery, Stoke-on-Trent, have all approved the valuation. The Staffordshire Hoard was discovered earlier this summer and received international media attention. It is considered to be one of the most important discoveries of Anglo-Saxon artefacts in England's history. Professor Norman Palmer, chariman of the Treasure Valuation Committee, said "The task of valuing this hoard required the Treasure Valuation Committee to analyse a very large amount of information in order to arrive at a fair market price, and I am personally indebted to my fellow members whose energy and expertise made this result possible in so short a time. "We are satisfied that we have arrived at a value which is both fair, and reflects the extraordinary interest and importance of this hoard." He added, "It was breathtaking – we all agreed that it was not only a challenge but a privilege to be dealing with material of such quantity, quality and beauty. It was hard to stop our imaginations running away with us." A fundraising campaign will now begin for the joint acquisition of the hoard by Birmingham Museum and Art Gallery and the Potteries Museum, Stoke-on-Trent. All relevant parties are fully in support of this joint acquisition and for the hoard to be displayed in the West Midlands. It also emerged that the Staffordshire hoard is even bigger than archeologists had initially indicated, with 1,800 individual items being unearthed at the 40 x 30 foot site — 300 more than previously stated. They include 84 sword caps, 71 hilt collars, helmets and parts of at least four crucifixes, with a folded gold cross singled out as one of the most valuable items in the hoard. Together, the artefacts contain more than 5kg (11lb) of gold — three times the amount found in 1939 at the Sutton Hoo burial site in Suffolk — and 2.5kg of silver. "It is quite possible that other finds from the same period might be in the vicinity," said Roger Bland, head of portable antiquities and treasure at the British Museum, who has co-written a new book about the Staffordshire hoard. The book will be available next month. Nicholas Brooks, emeritus professor of medieval history at the University of Birmingham, believes the hoard could represent a "royal treasury". He points out that Anglo-Saxon nobles paid a "heriot", or tax, in the form of weapons or bullion to their king when they died. In return, the king would honour the vassal's wishes about the disposal of his property. Mercian kings from this period, such as Wulfhere and Aethelred, are likely to have had a supply of weapons which they could give to young warriors joining their service. "This hoard could represent such a stock of weapons," said Brooks. "There's no comparable find of such gold or silver objects in either England or in Europe," said Bland. "All previous notable discoveries have been grave burials like Sutton Hoo." The annual award, consisting of $2,000 and a certificate, is intended as a grant-in-aid to stimulate active cooperation between scholars and performers by recognizing and fostering outstanding contributions to historical performing practices. Hudson's project will produce a commercial recording of previously unrecorded pieces of the trecento repertoire based on texts by identifiable poets, performed by the medieval vocal ensemble Liber: Ensemble for Early Music. The ensemble consists of tenor Hudson and soprano Melanie Germond, a voice teacher at Cochise College in Bisbee, Arizona. "It is wonderful to have our project recognized with such a prestigious award. I'm truly grateful for this honor," said Hudson. "Because the trecento repertoire is under-represented in both classical music recording and Italian literature studies, my hope is that the Greenberg award will bring attention to our recording, thereby raising awareness and stimulating discussion of both areas." With the assistance of Indiana University Professor of Musicology Thomas Mathiesen and Professor Margaret Bent of All Souls College, University of Oxford, Hudson will prepare new or revised transcriptions for the performance. H. Wayne Storey, IU professor of Italian and an expert on medieval Italian poetry, will serve as a consultant on the texts. For more information about the Jacobs School of Music and the Early Music Institute, see http://www.music.indiana.edu. Click here to go to the Facebook page for the Indiana University Jacobs School of Music. Moravian College in Pennsylvania will host an interdisciplinary Undergraduate Conference in Medieval and Early Modern Studies on Saturday, December 5, marking the fourth year that this notable academic conference will be held at the College. The conference and related activities have been designed to highlight the richness and interdisciplinary nature of medieval studies and early modern studies. The day-long program will showcase student scholarship and creative work, encourage students to consider future work in graduate and professional studies, provide students with the opportunity to present their work in a broader setting beyond the classroom, and build ties among medievalists and early modernists in the region. Students from colleges in the northeastern United States will present papers or performances related to art, history, English, music, philosophy, religion, and other disciplines dealing with the medieval and early modern eras. The keynote speech will be delivered by David Wallace, the Judith Rodin Professor of English at the University of Pennsylvania. A medievalist who looks forward to the early modern period, Wallace works on English and Italian matters with additional interests in French, German, Eastern Europe, women's writing, romance, "discovery" of the Americas and the history of slavery. He is currently editing a literary history of Europe, 1348-1418, a work of 600,000 words in 81 chapters to be published by Oxford University Press and supported by the Guggenheim Foundation. Professor Wallace has made a series of radio documentaries for BBC Radio 3 with producer Paul Quinn. Also, in October 2007 he gave the Clarendon Lectures in English at Oxford; these are currently being written into book form as "Strong Women: Life, Text, and Territory 1347-1645." Wallace's most recent book is Premodern Places: Calais to Surinam, Chaucer to Aphra Behn, and other publications include The Cambridge Companion to Medieval Women's Writing, and The Cambridge History of Medieval English Literature. Opening remarks will be presented at 9:15 a.m. by Jim Skalnik, assistant dean for academic advising at Moravian. Student presentations will begin at 9:40 a.m. and continue until the luncheon break at 11:40 p.m. with demonstrations by calligrapher Therese Swift-Hahn. Hesperus, known for being innovative, historically informed and multicultural, specializes in fusions of historic and living traditions. Founded in 1979 and named for Venus and the West Wind, the five-member group comprises several ensembles with overlapping membership that perform three kinds of programs: Cultural portraits featuring early and traditional music from a single culture, crossover fusions of European medieval and Renaissance music with American traditional styles such as Appalachian, Cajun, vaudeville and the blues, and single-genre early music programs of medieval, Renaissance and baroque music. Hesperus has toured nationally and internationally for more than two decades. Now in its fourth year, Moravian College hosted its first-ever Undergraduate Conference in Medieval and Early Modern Studies in December 2006. The event featured a rich exchange of scholarly ideas with 28 presentations by undergraduate students from various colleges and over 200 attendees representing 25 schools. Along with conventional slide lectures, the day was filled with performances and demonstrations, including a Renaissance dance by the Moravian Star Irish Dance Troupe and calligraphy by Therese Swift-Hahn, who returns this year. Other events included a plenary speech by Arthurian literature specialist Kelley Wickham-Crowley, a reception hosted by the Friends of Reeves Library, and a performance (to a packed house) by members of the Baltimore Consort and Quartetto Brio. The conference and associated activities are being organized by Sandy Bardsley , assistant professor of history, and John Black , assistant professor of English at Moravian College. A website for the conference can be found at http://www.moravian.edu/medieval.htm. Colchester Castle and Torre Abbey are among two historic sites that have been granted money by England's Heritage Lottery Fund, which will the medieval landmarks to carry out plans for ambitious projects. The Heritage Lottery Fund (HLF) announced that six historic sites were being awarded money, including Stonehenge and the Birmingham Museum and Art Gallery. The HLF is celebrating its 15th anniversary this month. Colchester Castle in Essex will receive £265,300 in development funding that will allow it to carry out refurbishments and prepare for a grant that will allow it carry out more significant upgrades to the site. Robyn Llewellyn, head of HLF East of England, said: "Alongside safeguarding the internationally important museum collection, the planned transformation will enable the museum to tell the story of Colchester from the archaeological discoveries detailing the Roman Circus to present day role as a garrison town. Although this announcement does not guarantee that at second-round an award will be made, HLF will offer the museum service full support in taking their application further." The museum now has up to two years to submit more detailed plans and apply for the £1.6 million of HLF support that they are seeking for an estimated £2.9 million overall project. The project's aim overall is to make the castle a major visitor attraction. Peter Berridge, the manager of Colchester Castle Museum, said: "We are so delighted with the news - this first round pass enables us to move forward into phase two of our plans to develop the Castle, its collections, stories and visitors' facilities with the ultimate aim to increase and build on the high-quality experience we offer and further improving and providing a top-quality experience for our audiences." Colchester Castle is one the England's finest surviving Norman buildings and shares a ground plan, and possibly the same architect, with the White Tower in London. The Castle's museum, a popular local attraction, tells the story of the early development of Colchester, Roman Britain's first capital, and is particularly important for its collections of Iron Age and early Roman finds from Colchester and Essex. Torre Abbey in Devon will also receive £124,000 in development funding that will allow it to draw up plans for £5 million project to restore portions of the site and to create a museum and art gallery. Dr Michael Rhodes, head of museum services for Torbay Council, said: "This is fantastic news. The amount of funding available has reduced and there is stiff competition from around the country. "It is a tribute to the hard work of the team who put the bid together, the support of the Friends of Torre Abbey, the council as a whole and the Torbay Development Agency." Torre Abbey was founded as a monastery in 1196. Its original church is little more than a ruin, with only the west and south sides of the cloisters still standing. The gatehouse dates from around 1380, and the barrel vault above the chapel, formerly the guest hall, dates from the 15th century. The tithe barn, built along with the abbey in the early thirteenth century, is known as "The Spanish Barn" after it was used to hold 397 prisoners of war from the Spanish Armada in 1588. Meanwhile, another medieval site is looking into the possibility of receiving funding. Archaeological work is being done on Bardney Abbey in Lincolnshire, to see if the Benedictine monastery can be restored. Bardney Abbey dates back to the 7th century, and was in use until the 16th century. The site was excavated from 1909 to 1922, which revealed the layout of several buildings. But because the ruins were quickly deteriorating from exposure to weather, the whole site was again covered up. The work to uncover Bardney Abbey is being carried out on behalf of The Jews' Court Trust. 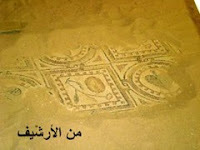 The aim is to find out if the ruins can be safely restored and displayed. David Start from the Trust said they will apply for Lottery funding if the structure is able to be revived. "The site is steeped in history and we would love to see it opened up, using folk from Lincolnshire to do the work, so that it is a community project," he said. "We have a team of archaeologists digging four trenches to uncover the ruins, which will be assessed by an official conservationist before we fill them back in to keep the area protected." Maney Publishing has released volume 53 of Medieval Archaeology: Journal of the Society for Medieval Archaeology. This academic journal comes out once per year, and specializes in the medieval archaeology of Britain and Ireland. Abstract: Analysis of an important collection of bone/antler hair combs from Atlantic Scotland has illuminated the chronology of early-medieval Scandinavian settlement in the region. Application of a new typology, identification of variations in manufacturing practice and analysis of spatial patterning throw light on the development of combs traditionally seen as characteristic of early-historic Atlantic Scotland. The application of new techniques of raw material analysis demonstrates the probable use of reindeer antler in combs of 'native' style. However, none of these combs is from contexts that can confidently be dated to the 8th century or earlier, and the pattern is indicative of Norse-native coexistence (peaceful or otherwise) in the 9th century, but not before. The comb evidence demonstrates a Scandinavian presence throughout Atlantic Scotland from early in the Viking Age, but also highlights the importance of contact with Ireland and Anglo-Saxon England. Abstract: A fresh account of the evidence for the Anglo-Saxon W porch at St Mary's Church, Deerhurst, with special reference to the elaborate second-floor chapel, suggests (contrary to recent opinion) that the walls of this high-level chapel are of one build with the W wall of the nave. A series of blocked sockets around three sides of the porch and in the W wall of the nave formerly held a complex series of interlocking beams, which supported an internal floor and extended externally to form a projecting walkway round three sides of the porch. This timber arrangement not only adds to our knowledge of Anglo-Saxon building techniques, but is also the only unambiguous example of such a structure between late Antiquity and the central Middle Ages. The surviving walkway at St Peter, Beho (Belgium) and the evidence of various manuscript illustrations, most notably a 10th-century Spanish depiction of a tower with a projecting walkway, offer parallels; ultimately these derive from classical precedents. The extension of the walkway round the porch at Deerhurst implies liturgical ceremonies of some complexity. At Beho a priest displayed relics from the walkway in the 18th century; the display of relics was probably also the principal function of the Deerhurst walkway. Abstract: Advances in the understanding of the Anglo-Saxon burh in the last 25 years, a reassessment of the date and context of the Burghal Hidage and a recent analysis of comparable archaeological evidence from Cricklade make it necessary to review the archaeological evidence of the defences of the late-Saxon burh at Christchurch. This enables a reconstruction of the urban landscape, which in turn allows a new view of the significance of hidage assessments in the Burghal Hidage for all the burhs in the system it describes. It also places the development of Christchurch in the context of that of other burhs in Wessex and southern Mercia, and throws a new light on general historical processes in the 9th to the early 11th centuries. Abstract: Surviving churches and documents are analysed for what they may reveal about the architectural context of the mass in early-medieval Ireland. This shows that there is no evidence to support the widely held view that the congregation stood outside. Instead, the variable but relatively small size of these churches expresses the fact that they served smaller and more diverse communities than their high-medieval successors. The altars in large episcopal and/or monastic churches seem positioned further west than those in relatively small, pastoral churches. In part, this was probably to facilitate relatively complex eucharistic liturgies. Externally defined chancels appear for the first time in the late 11th century AD in response to an increased emphasis on the real presence of Christ in the Eucharist. Significantly, they occur at a handful of important sites whose clerics and patrons were in direct contact with Lanfranc of Canterbury, a key exponent of this doctrine. Abstract: Almost 180 years of scholarship on the Lewis chessmen have given us a solid foundation of understanding, primarily based upon their art-historical analysis. Taking a more interdisciplinary approach (combining elements of art history with archaeology and history), this paper focuses on some over-looked themes — primarily the archaeological, gaming and political contexts of the 12th- and 13th-century North Sea world — and some more familiar themes but in a new light. We suggest a more fluid composition and function of the gaming hoard, with at least four sets of chessmen from the same workshop conceivably made for use in Lewis, possibly in the early 13th century. Abstract: This is the first multi-disciplinary study of Swedish local thing (assembly) sites of the Viking Age through to the late Middle Ages. Previous studies ignored the larger body of evidence, producing models that are too generalising and often one-dimensional. A systematic overview of the location, features and landscape characteristics of things in the county of Södermanland enables exploration of wider questions, such as the development of the thing organisation and the beginnings of state formation in Sweden. This suggests late-Viking thing sites, mainly created in 11th century, are Christian sites, established by local magnates in response to the growing central power. The similarities and conformity of sites, together with a reorganisation of the defensive systems from inland lakes to coastal areas, suggest there was a sense of growing unity and unification within Sweden at this time. Abstract: The saga of the People of Vatnsdalur (Vatnsdaelasaga) provides a case study for a new approach to the Sagas of Icelanders (Íslendingasögur). This treats the saga as a cultural product of the 13th century that can give insights into its creator's ideas and worldviews. Fieldwork at five sites in the Vatnsdalur valley in NW Iceland seeks to establish what these places were like in the 13th century. This knowledge, alongside the saga and place-name evidence, illustrates how the saga writer, presumed to come from a powerful 13th-century family, systematically used the landscape and archaeological remains in the valley to serve his political interests when describing 10th-century events. Abstract: One of the most sustained monolithic traditions of Irish archaeology is the classification of a wide variety of earthen and stone enclosures (ráth and caisel) as 'ring-forts'. This is an impediment to understanding the significant changes that native enclosed settlement underwent through time since it encourages archaeologists to fit their evidence to the category rather than to assess each enclosed settlement on its own merits. It also conceals differences between various forms of enclosed settlements inhabited from the 7th to the 17th century AD, occasionally later. The proposal is therefore that the 'ring-fort' is a chimera and that the use of that term should be discontinued so that study of native enclosed settlement can be liberated from its insular base and used to explore social change in Ireland. A field study from the Burren, Co Clare is used in support of this argument. Click here to go to the journal's website on IngentaConnect. We will be reporting on details of some of the articles in Medieval Archaeology over the next few days and weeks. Previously, we reported on Lewis Chessmen might not be Chessmen, which is based on one of the articles in this year's issue. Ubisoft announced record first week sales performance for its Assassin’s Creed II video game with 1.6 million units sold through worldwide according to internal estimates. This represents 32% growth over the first week sales of the first Assassin’s Creed. Launched in November 2007, Assassin’s Creed remains the fastest selling new video game intellectual property ever in the U.S.
Assassin’s Creed II has received an overwhelmingly positive reception from gamers around the world and from the video game trade press with to date an average user rating of 94% on Gamespot.com and over 91% average critics score according to GameRankings.com. Assassin’s Creed II invites players to become Ezio, a privileged young noble in 15th century Italy who’s been betrayed by the rival ruling families of Italy. Ezio’s subsequent quest for vengeance plunges players into a captivating and epic story that offers more variety in missions, surprising and engaging new game play elements, diverse weapons, incredible depth and lasting appeal and a profound character progression that will appeal to fans of the original Assassin’s Creed as well as entice players new to the brand. In previous announcements, Ubisoft said it expects Assassin’s Creed II will sell more than eight million units after it is released throughout the world. "We found that when information in the film was consistent with information in the text, watching the film clips increased correct recall by about 50 percent relative to reading the text alone," explains Andrew Butler, a psychology doctoral student in Arts & Sciences. "In contrast, when information in the film directly contradicted the text, people often falsely recalled the misinformation portrayed in the film, sometimes as much as 50 percent of the time." "The misleading effect occurred even when people were reminded of the potentially inaccurate nature of popular films right before viewing the film," Butler says. "However, the effect was completely negated when a specific warning about the particular inaccuracy was provided before the film." Butler conducted the study with colleagues in the Department of Psychology's Memory Lab. Co-authors include fellow doctoral student Franklin M. Zaromb, postdoctoral researcher Keith B. Lyle and Henry L. "Roddy" Roediger III, the Lab's principal investigator and the James S. McDonnell Distinguished University Professor of Psychology. "These results have implications for the common educational practice of using popular films as an instructional aid," Butler concludes. "Although films may increase learning and interest in the classroom, educators should be aware that students might learn inaccurate information, too, even if the correct information has been presented in a text. More broadly, these same positive and negative effects apply to the consumption of popular history films by the general public." Dr. James Masschaele discusses his research into European juries during the Middle Ages. He talks about the similarities and differences between those juries and contemporary ones, and offers a few interesting anecdotes about some judgements made my these juries. Dr. Masschaele is Professor and Chair of the Department of History at Rutgers University and received his Ph.D. from the University of Toronto. 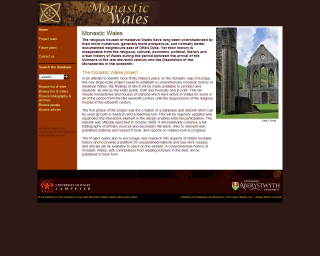 The website has been developed as part of the Monastic Wales Project, a collaboration between Professor Janet Burton of the Research Institute of Archaeology, History & Anthropology at the University of Wales Lampeter and Dr Karen Stöber of the Department of History & Welsh History at Aberystwyth University. The Monastic Wales Project has been funded by the Research Infrastructure Fund at the University of Wales Lampeter and the Marc Fitch Fund. The website was designed by Martin Crampin of the University of Wales Centre for Advanced Welsh & Celtic Studies, the database developed by Nigel Callaghan of Technoleg Taliesin Cyf. and research undertaken by Dr Julie Kerr, University of St Andrews. It is hoped that in the near future the website will also be available in a Welsh language version. The site is designed to allow continual updates as further material becomes available, and users are encouraged to contribute relevant information and to use it as a record of work in progress. Scholars will be invited to contribute essays, articles and short surveys on various aspects of Wales’s monastic history. An educational version for use by schools is also being considered. The Monastic Wales website can be accessed at www.monasticwales.org. The recently released book The Grand Strategy of the Byzantine Empire is becoming a big influence, among Byzantine historians as well as American military strategists. The book is by Edward N. Luttwak, a senior associate at the Center for Strategic and International Studies in Washington D.C., who spends most of his time working with governments to develop their foreign and military policies. Sometimes controversial, Luttwak has written over a dozen books, but this is only his second examining history. His first, The Grand Strategy of the Roman Empire, generated buzz and criticism from Roman military historians, but also served to spur on new research. In an interview with Medievalists.net, a Luttwak explains that he was going to write the Byzantine volume over thirty years ago, but had to hold off because of a lack of access to texts. But then "Byzantine studies emerged from near-nullity to make great advances which allowed me to continue" says Luttwak, adding "by then I was far too fascinated by the great epic of Byzantine strategic success to give up." The premise of The Grand Strategy of the Byzantine Empire is that Byzantium was actually quite successful in defending its lands against a multitude of enemies, including the Persians, Arabs and Bulgars. Luttwak explains that the Byzantines did "everything possible to raise, equip and train (above all) the best possible army and navy, and then… do everything possible to use them as little as possible. Instead of seeking the battle of attrtition and annihilation in the classic Roman manner, every alternative was to be tried to avoid , or at least minimize the destructive “attrition” combat of main forces. Instead, potential enemies were to be dissuaded, bribed, subverted, weakened by getting others to attack them, sidetracked into other ventures; if enemy forces attacked nonetheless, they were to be contained and delayed by skirmishing, feints and demostrations while the search went on for other powers near or far willing to attack or at least threaten the enemy power; if enemy attacks persisted nonetheless, they were to be met by countering maneuvers designed to exhaust them rather that the destructive combat of main forces, the very last resort." John Haldon, one of the leading historians on the Byzantine military, largely agrees with Luttwak. "The Byzantine approach to warfare was very conservative," Haldon says. "It was a much more sensible approach," considering that the Byzantines were often surrounded by enemies and did not have the economic resources that their neighbors possessed. Haldon suggests that "the big picture argument" of Luttwak will hold up from academic scrutiny, although one can "nitpick at certain points." For example, Haldon believes the book would have been better served if it focused more on the sixth and seventh centuries. The popularity of The Grand Strategy of the Byzantine Empire lies not only with medievalists. Because of Luttwak's credentials as a military strategist, his book is being seen by many as having relevance for America with its current troubles in the Middle East and Afghanistan. For instance, a reviewer for the Washington Times notes "American soldiers and diplomats who helped turn enemies into allies in creating the Sunni Awakening in Iraq will recognize and empathize with what the Eastern Romans did for centuries. This is a timely and relevant work." Luttwak added to this perception by writing an article in Foreign Policy, an influential political magazine in the United States. In his article, "Take Me Back to Constantinople: How Byzantium, not Rome, can help preserve Pax Americana," Luttnak offers seven lessons for the United States "if it wishes to remain a great power." They include 'Avoid war by every possible means' and 'Subversion is the cheapest path to victory'. Luttwak admits that the he was convinced into writing the article "by a devilishly persuasive editor, who reacted over-enthusiastically to the book and actually wrote the heading and opening paragraph." But he adds that while comparing Byzantium with America can be a stretch, "I must nevertheless recognize that in extreme cases something can perhaps be learned from the Byzantines after all. For example, instead of keeping tens of thousands of troops in Afghanistan at a cost of roughly one million per soldier per year, for an annual expenditure of more than forty billion dollars to fight perhaps 25,000 Taliban, the Byzantines would have sent a couple of Pashtu-speaking eunuchs to the Khyber Pass border with bags of gold to buy out and relocate Taliban leaders and followers–and they would have run out of Talibs to purchase long before spending four billion, let alone forty." Mystical Marriage in the Middle Ages: Divine or Diabolical? In the early Christian church, the image of the “Bride of Christ,” was first used to describe the soul’s connection to Jesus Christ. But eventually, the symbolic marriage of women to Christ became a way enforce submission to patriarchal authority, said Dyan Elliott, Ph.D., in a lecture last week at Fordham University. Elliott, the Peter B. Ritzma Professor of Humanities at Northwestern University, delivered “Mystical Marriage in the Middle Ages: Divine or Diabolical?” at the William D. Walsh Family Library on the Rose Hill campus of Fordham University. “The traditional understanding of the consecrated virgin as Bride of Christ is a concept so intrinsic to female spirituality and so familiar to medievalists, that it’s difficult to imagine a time when it was otherwise,” she said. The story of its descent, she said, is a striking example of a religion whose central mystery is “the word made flesh.” Although the history of the “Bride of Christ” stretches from late antiquity to the 15th century, it has several notable highlights. The relationship between God and Israel, she noted, was compared to a marriage. “The apostle Paul talked about it, too. In comparing the marriage of the soul to God, he appropriated the role of a nervous father of the bride, saying, ‘I am jealous over you with Godly jealousy, for I have espoused you to one husband, that I may present you as a chaste virgin to Christ,’” Elliott said. Tertullian held a radically different vision of the cosmos, one in which heaven and earth intersected at many points, and where sexual relations with supernatural beings was a possibility, she noted. “He was obsessed with the history of the watcher angels in Genesis 6, whose intermarriage with the daughters of men precipitated God’s decision to flood the earth,” said Elliott, author of Proving Woman: Female Spirituality and Inquisitional Culture in the Later Middle Ages . “A deacon and several consecrated virgins kept house and even slept together, attempting to reap the androgynous benefits of chastity,” she said. “But to Cyprian, it was adultery. The Crux Vaticana, a cross given to the city of Rome by a Byzantine emperor in the 6th century, has been restored after two years of work. The jewel-encrusted golden cross is said to contain a piece of the cross carried by Jesus Christ. The Papacy has been using the Crux Vaticana for nearly 1500 years during Easter and Christmas ceremonies at the Vatican, and over the centuries grime and wax have dulled its colour. An attempt at restoring the cross in the 19th century caused further corrosion. According to Sante Guido, who restored the cross, the changes include replacing some of the gems (which had been added to it in previous centuries) on the cross with twelve pearls along with emeralds and sapphires. Guido said to Associate Press, "It's the most important reliquary of the 'true cross' that we have. It's particularly important because it's the only reliquary that came from an emperor, so there are various levels of religious and historic significance." Ioli Kalavrezou, a Byzantine art history professor at Harvard University, commented that this restoration will make the cross look more like its original state. "I can't say it's exactly as it would've been, but it comes much closer to what an object like that would've looked like," she said. The Byzantine Emperor Justin II gave the Crux Vaticana to the people of Rome sometime between 565-578. The cross contains the following inscription written in Latin: "With the wood with which Christ conquered man's enemy, Justin gives his help to Rome and his wife offers the ornamentation." The restoration was paid for by an anonymous donor. The Crux Vaticana will be on public display inside St. Peter's Basilica until April 12. Chaos had reigned in the northern kingdom, and chaos would come again. But for a few short decades, peace had a toehold. In these years, one of history's greatest minds flourished. The Northumbrian monk known as "Venerable Bede" (c.672-735) has been called "the teacher of the whole Middle Ages" and "the father of English history." For Stanford Professor Emeritus George Hardin Brown, one of the world's leading Bede scholars and author of the newly published A Companion to Bede, he is something more: The early scholar has been Brown's lifetime's work. Bede was the ultimate polymath – a master of every subject of his time: poetic principles and practice, mathematics, astronomy, history, theology, grammar. Most famously, he is the author of The Ecclesiastical History of the English People, considered one of the most important sources on Anglo-Saxon history. "The reason I have worked with him and his works for years is that it takes a long time to cover all he did and the history he made," Brown said at a "Bede Celebration" recently at Stanford's Green Library, which also showcased recent Bedan acquisitions. "Others have written on him as an historian, or computist, or scripture scholar, and so forth. I'm one of the few who has tried to encompass all he wrote, and I have tried to digest that knowledge succinctly in this book." Bede was the author of more than 40 works. "In his time, there was no one like him," said Brown of the largely self-taught author of biblical commentaries, saints' lives and homilies, as well as works of science and mathematics and the "reckoning of time." He not only wrote and taught, but he made the copies as well. "I myself am at once my own dictator, stenographer and copyist," Bede wrote to a friend. Brown is the founder of Stanford's Medieval Studies program, which he chaired for a dozen years. He was recently named a Fellow of the Society of Antiquaries of London, in addition to being a Fellow of the Medieval Academy of America. But the title he cherishes most is an unofficial one: "Bedemeister." Brown's prominence at Stanford triggered a series of library acquisitions. 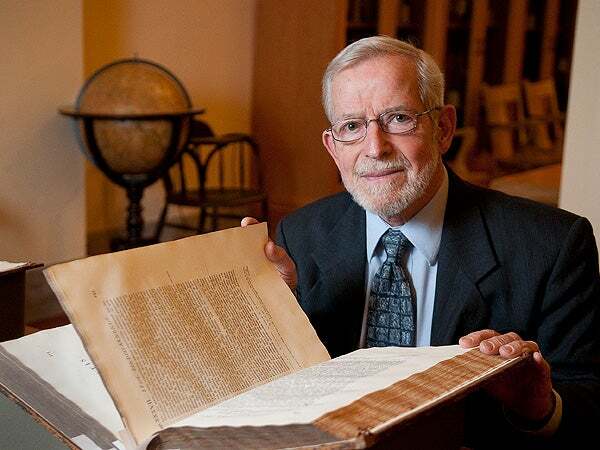 "With an eminent Bede scholar such as George Brown here on our faculty, important antiquarian editions of Bede seemed very sound acquisitions for us," said John Mustain, rare books librarian and classics bibliographer at the Stanford University Libraries. Although the collection remains "relatively modest" at less than two dozen volumes, all on display at the celebration, the library has added them "fairly aggressively over the past 10 years, as part of an effort to strengthen our holdings in antiquarian editions of medieval authors in general, and antiquarian editions of Bede in particular," Mustain said. Bede likely would have approved. He was, as English Department Chair Jennifer Summit said, "a creature of the library." Book collections are not usually associated in the public mind to the rough world of Beowulf, a work that may have come from this period, yet Bede was privy to a library that included nearly 300 books, making it one of the best in Europe. "It was a terrific library. Because of it, Bede was able to read and write his work," said Brown. There was hardly any need to leave home: In his lifetime, Bede stayed within 30 miles of his base at the remote but well-endowed Northumbrian monastery of Wearmouth-Jarrow. 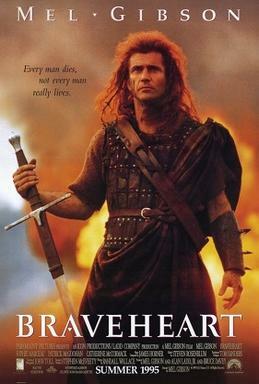 Although murder and treachery had been the norm during the time Britain was governed by warring chieftains, Brown said that the years Bede lived were uncommonly safe. Bede himself wrote that a woman and child could walk across England unmolested. The goal of Bede's quiet life was to "bring people close to God," said Brown. "He wasn't going out preaching – but it was the message in everything that he was doing. Everything was directed to the Kingdom of God." Peace didn't last long. By the end of the eighth century, Wearmouth-Jarrow was the second target of the Vikings, after the island jewel of Lindisfarne. "They all got bumped by the Vikings. They were easy marks, with undefended wealth," said Brown. Within decades after that, the Danes would demolish what was left of Bede's monastery. Many of his original manuscripts were destroyed, but the Vikings were too late to destroy his legacy. Bede's work had been in high-demand since his death, and his popularity ensured survival. Bede's renowned saintliness created a few other distinctions in the ensuing centuries: He is the only monk who is named a doctor of the Church – and Dante made him the only Englishman in Paradiso. He's in Canto X, the "Circle of the Sun" – one of three men "who in contemplation exceeded Man."